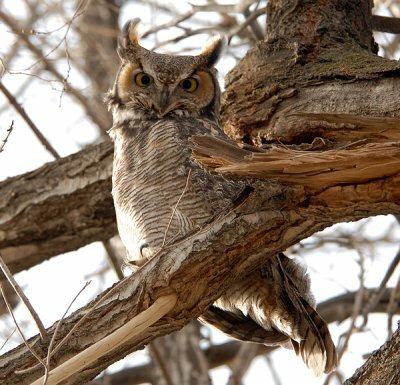 Great-horned and other nocturnal owls have phenomenal nighttime vision. In some respects—they see much better by night than we can by the light of the sun. 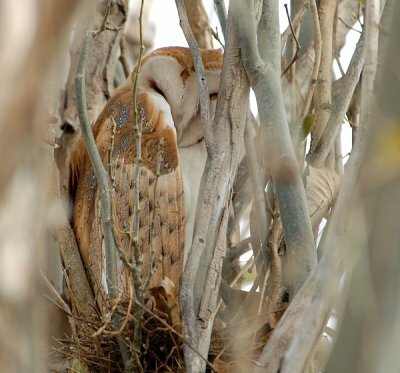 The visual acuity of owls springs from a number of interesting adaptations. Of course you’ve noticed that owls have big eyes. If our eyes were in the same proportion to the size of our head, they would be the size of grapefruits! Large owl corneas and lenses help maximize the amount of light received by the retina. There are two types of photo receptors in the retina. Cones operate in bright light and give fine detail and color vision. Rods work with much less light but compromise somewhat on detail and color. Owl eyes contain considerably more rods than cones while the eyes of daytime animals–like us –contain many more cones than rods. Owls –and other nocturnal creatures—have a mirror-like structure behind the retina called a tapetum. Light passes through the rods and cones, strikes the tapetum and is reflected back through the eye to the light source. The tapetum ensures that any light unabsorbed by receptor cells is reflected back through the eye. This gives the receptor cells a second chance at stimulating the rods. Owls, like most predators, have eyes positioned forward on the face and looking in the same direction. The resulting binocular vision gives the owl a three dimensional perspective. By accurately sensing depth, the owl can zero in on a tasty little mouse scurrying across a field and make adjustments on the wing as it closes in for a kill. To help triangulate even more precisely, owls will often bob or weave their heads to get several viewpoints of an object. Finally, because of their unique eye structure, owls cannot move their eyes within the sockets. No worries! The owl just moves its whole head instead. On an exceptionally mobile neck, an owl head can rotate at least 270 degrees from side to side and 90 degrees up and down. Sparks, John and Tony Soper. 1989. Owls: Their Natural and Unnatural History. NY: Facts on File.